Doom Patrol took a trippy and metatheatrical turn this week in “Doom Patrol Patrol,” which introduced fans to several members of the expanded comic book team and turned them into a cautionary tale for the current television line-up. Thanks to a hot tip from Mr. Nobody (also known as Mr. Not-Appearing-In-This-Episode), Jane (Diane Guerrero) dragged Larry (Matt Bomer) and Rita (April Bowlby) to Niles Caulder’s School For Gifted Metas, where retired members of a previous Doom Patrol supposedly taught new students. Meanwhile, Vic (Joivan Wade) dealt with the return of his father and Cliff (Brendan Fraser) tried to figure out if he could still be a father to Clara. Exes can be such a nightmare. 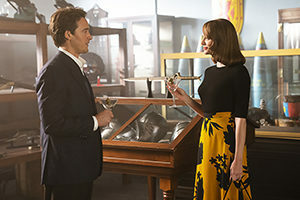 “Doom Patrol Patrol” opened on the revelation that Elliot did not in fact survive the lack of apocalypse, something which upset Rita deeply and showcased how much she’s grown since her heyday 1950s. It was juxtaposed with a particularly disturbing memory from 1956, in which she was forced to provide favors for a despicable Hollywood producer in exchange for a role… That is, until she blobbed him to death entirely by accident. One kind hearted secretary helped her escape any blame, but Rita still hadn’t managed to escape the guilt she felt – for that incident and many more that have yet to be unveiled. Throughout the episode and via snippets of her relationship with Steve Dayton, known as the hero Mento, we learned how she came to control her body and why she couldn’t quite control her fears. But first they had to meet Mento and the rest of yesteryear’s supers. Since Vic was stuck in safety mode, the team had to search for Mr. Nobody’s Doom Patrol hints the old-fashioned way: through old newspaper files and Rita’s introspective (read: self-centered) memories of Mento. Larry and Rita got a ride directly to their current residence courtesy of Flit, where the trio discovered that Mento, Celsius and Lodestone were teachers at a school for young metahumans while still remaining impossibly young themselves. Did Niles make everyone immortal? A man named Joshua Clay, who is Tempest if you read the older comics, appeared to be the school administrator and also to be familiar with Jane. Upon learning that Cliff once discussed sending Jane to this school, she went down her own shame spiral wondering if her father figure wanted to get rid of her – which was nothing compared to the terrifying nightmare of a different father figure that she experienced when Mento’s powers went haywire. More on that later. The flashbacks between Rita, Niles (Timothy Dalton) and Steve explained how the latter taught her mind over blob matter and helped her gather herself – all while they slowly fell for each other. But though he promised to stay out of her head with his psychic abilities, he broke his word as soon they got together and rejected the horrors (having to do with a girl named Mary Beth?) he saw in her memories. “Doom Patrol Patrol” got really weird when Arani, AKA Celsius, revealed that she was married to Cliff and that he had a daughter. Simultaneously, Steve began describing a particularly strange memory of the Patrol facing off against Mr. Nobody only to be rescued by Mento himself and a powerless Niles. Larry was already questioning the veracity of that statement, but his suspension of disbelief completely broke when Niles came into the room and had no idea he was even captured by Mr. Nobody recently. It was then that the illusion broke, because there actually were no students and the heroes were actually in their 70s and 80s rather than the youthful images they had projected all episode. Jane, Rita and Larry were faced with their worst fears in the wake of Mento’s powers going haywire – because it was his mind control that had kept everyone in their safe and happy illusion in the first place. Arani had never married Cliff, Steve lost the fight against Mr. Nobody and was lost within his own mind, and Rhea (Lodestone) could barely move from her bed. Joshua was not an administrator, but their doctor, and Jane’s admission into the location was a sign that Niles had given up on her. Daddy issues make the world go ’round. Cliff, on the other hand, was begging Vic to hack his daughter’s “Face Hole” so he could connect with her. Those father-daughter parallels between Cliff and Jane sure come on strong, don’t they? When Silas Stone came by to fix his son up, he also took the take to make improvements to Cliff’s machinery, and thus both men decided to work on each other’s daddy issues. Cliff actively defended Vic to his father, letting him know that Cyborg lost his arm cannon doing a heroic deed and wasn’t actually reckless. Vic got a hug from his father (and a USB!) while Cliff got to look at his daughter’s pictures, only to find out that she had gotten herself a replacement dad in the intervening years. The most powerful throughline of “Doom Patrol Patrol” was Rita learning to face her past mistakes in order to become a better person, but the first-generation superheroes left their own lasting impression. As the group said their farewells to the relics of the past – who were still fully submerged in their delusions by the end of the episode – Jane struggled to reconcile the Niles she knew with the man that would abandon his charges. In order to understand why, though, she’ll have to rescue him from Mr. Nobody first. Doom Patrol drops new episodes every Friday on the DC Universe streaming service.